In any business, it’s the entrepreneur where the proverbial ‘buck’ stops.Yes, it’s a cliché, but that is what it boils down to. When things go wrong, it’s your responsibility; when they go well, you get to enjoy the benefits. Ashutosh Garg was a high-flying corporate honcho who decided to quit and pursue his dream of becoming an entrepreneur. But just having a dream is not enough, he discovered; one needs to be resourceful, pragmatic, weigh the pros and cons and, most of all, have the will to keep going in the face of all odds. In The Buck Stops Here, Garg compresses the key learnings and experiences from building Guardian Pharmacy, India’s second largest chain of wellness, health and beauty stores. He reveals the realities of running one’s own business and dispels some myths along the way. Learn how to source capital; get the best from your team—and yourself; manage costs; locate the perfect shop space; find the right partners to grow your business; and at the same time, manage your stress levels. These lessons will both inspire budding entrepreneurs to follow their dream as well as caution them about the challenges that lie ahead. 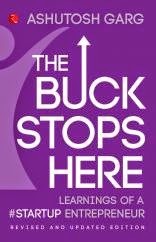 Written by someone who has actually experienced the highs and lows of being a #Startup Entrepreneur, The Buck Stops Here is essential reading for those who dream of running their own business. Ashutosh Garg, worked in the corporate sector for twenty-five years before launching Guardian Pharmacy. He was with ITC Limited for seventeen years, leaving in 1995 as managing director of one of the group companies. Thereafter, he spent eight years in the aerospace industry. He has been a regular contributor to publications such as Business India and The Economic Times, and is the author of The Corner Office. Having recently quit my high flying corporate job after a decade there this book was like a perfect read at the most appropriate time. Being your own boss seems so tempting and lucrative that each one of us wants to attempt it in life atleast once. But we don't understand the nitty gritties that go behind it.This book looks like the answer to all those things making the move swift and easy. This book holds the ABC of entrepreneurship. The lessons are so very well articulated that you cannot help but nod in approval. From the first chapter to the last it feels as if author holds your hands and takes you through the whole process of setting up your own business. Laced with his own anecdotes and experiences this makes a very lively read. One that inspires you, motivates you and makes you respect the courage that goes behind this whole decision of moving from a plush job and chasing your dreams. Dreams come at a price, and the price is hard work. Sheer hardwork and nothing else. But the other things that will make this journey more lucrative is those minute things which otherwise get unnoticed. This book ensures you put your attention to all those things and make them work to add that much needed zing to your dream. Strongly recommended for people who have a dream and are waiting to work on them! 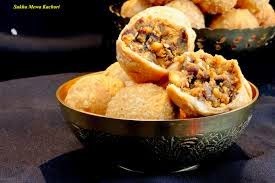 This book is dry fruit kachori - crispy, crunchy, sweet, spicy and tangy. Your book review is really interesting. I feel like reading that at once.But I get time hardly to read all those.